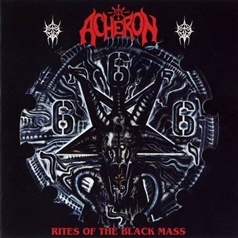 Released in April 1992, through Turbo Music, Rites of the Black Mass is the first full-length album from the American Death/Black Metal band, Acheron. Recorded in the wretched hellhole known as Morrisound, this album is still fairly decent and manages to stand out from many of its contemporaries. While the band was unable to maintain such consistency with its later output, their debut is well worth listening to. I recall first hearing this album one night after watching some old horror movies with a friend. With visions of Vincent Price and the Tall Man still fresh in my head, Rites of the Black Mass suited the atmosphere, perfectly. Of the two albums that we checked out that night, the other being the disappointing Testimony of the Ancients from Pestilence, Acheron definitely stood out. The album features twenty tracks, ten proper songs with intros in-between. Before each song is a guy reciting, what I assume to be, verses from the Satanic Bible that are accompanied by keyboards that give the whole thing the vibe of an old horror movie. For some, this might be a little distracting, but it does serve to create a darker atmosphere than the typical Death Metal album of the period. To that point, the fact that Acheron focused on Satanic themes rather than the usual gore lyrics that dominate this style of music is rather refreshing. Musically, this has always reminded me of the first albums from Deicide and Incantation, to an extent. The former moreso because of Crowley's vocal performance, utilizing some higher-pitched overdubs in a similar manner to Glen Benton. The songwriting is pretty simplistic and even the faster tracks, like "To Thee We Confess" or "The Enochian Key" are rather 'relaxed' when compared to the blastbeats of an album like Onward to Golgotha. One can definitely tell that these songs were written in '89/'90, as they still possess more of an old school approach. There are a lot of memorable mid-paced riffs throughout the album, such as in "Ave Satanas" and "Unholy Praises", often accentuated with great leads as well. At times, one is likely to be reminded of early Morbid Angel, regarding Slate's solos and some of the drumming as well. While being fairly basic, the compositions are all distinct and engaging and the album certainly delivers on all fronts. The production is a bit muddled and would probably have benefited from a sharper guitar tone, but such is par for the course when it comes to Morrisound. When people speak of the classic Death Metal albums from this period, Acheron is rarely mentioned. That is quite unfortunate, as Rites of the Black Mass is one of the most solid efforts to emerge from the old days. Had it been recorded and released a year or two earlier, and distributed by a better label, it may have received more praise and attention. This album is highly recommended for those into old school, blackened Death Metal. Seek this out!